A lot of us who use Linux at work/school or have always grown up using Unix commands and using the Unix shell for years and more often than not, there are instances where a ls command comes more naturally than the dir command at the command prompt when using Windows. For the most part, a lot of us work around this drawback using the excellent tool: Cygwin. Cygwin is available for windows users here.The Cygwin tools are ports of the popular GNU development tools for Microsoft Windows. They run thanks to the Cygwin library which provides the UNIX system calls and environment these programs expect. With these tools installed, it is possible to write Win32 console or GUI applications that make use of the standard Microsoft Win32 API and/or the Cygwin API. As a result, it is possible to easily port many significant Unix programs without the need for extensive changes to the source code. This includes configuring and building most of the available GNU software . Even if the development tools are of little to no use to you, you may have interest in the many standard Unix utilities provided with the package. They can be used both from the bash shell (provided) or from the standard Windows command shell. While Cygwin would be an obvious choice for many Unix/Linux power users, there is an excellent and a much simpler alternative to using Cygwin. In this article, I will show you how to run your Unix commands right in the windows command prompt. For this, we will be using CoreUtils. CoreUtils is a collection of basic file, shell and text manipulation utilities of the GNU operating system. These are the core utilities which are expected to exist on every OS. And when I talk about File utilities, they include chgrp, chmod, cp, dd, du, ln, ls, mkdir, mv, rm, touch, vdir among others. A sample of the text utilities include cat, cksum, cut, join, md5sum, shasum, sort, split etc. The shell root commands include echo, chroot, hostname, nice, pathchk, tty, who, whoami and yes su. So it is pretty much the whole nine yards here… The direct link for download of the CoreUtils package available through SourceForge is available here. 3. 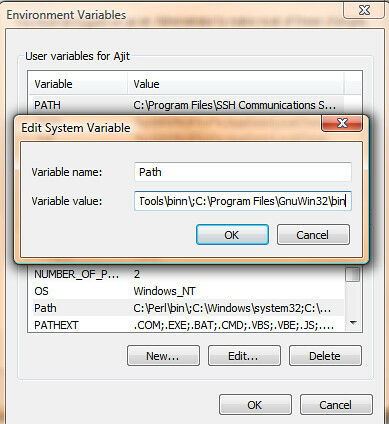 In the System Variables pane, scroll down to Path and then click on edit.